Hon. 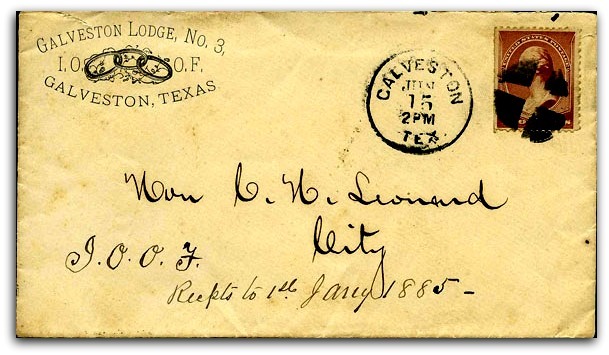 Charles Henry Leonard, Galveston, was born in the south of Ireland, March 25, 1813. His parents were Colonel George Leonard and Jane Percy. The father belonged to the British army and served in the war of 1812 against the United States, but afterward became a personal friend of General Andrew Jackson, whom he frequently visited while the latter was President. Mr. Leonard's grandfather, George Leonard, was an Irish country gentleman, whose wealth and abundant leisure enabled him to indulge his taste for sport and to live the ideal life of his class. Several of the uncles of Charles Henry on both sides were officers in the army and navy of Great Britain, one of them also being a member of the British parliament. Mr. Leonard's mother was a native of north England, and was a daughter of Sir James Percy, of an old English house.Charles H. Leonard was partly educated at King's College, at Toronto, Canada, which institution he left at the age of twenty. He came to the United States in the spring of 1834, and, going to Washington city, presented himself to General Jackson, General Lewis Cass and other distinguished gentlemen as the son of Colonel Leonard, whom they had known and who had frequently been their visitor at the national seat of government. Furnished with letters of introduction from these gentlemen, he started West and entered on a career in some respects interesting and adventurous. After some time spent in the upper Mississippi valley he drifted to New Orleans, where he happened to be at the time of the breaking out of the Seminole war in Florida. Upon the call for volunteers for service in that war he offered himself, joining a company then being raised, but before the company was mustered into service the Governor of Louisiana received information that no more troops were needed, as the war was over, which, however, turned out not to be true, as the war lasted for some years afterward. But young Leonard was ready for adventure, and, having had the martial spirit somewhat stirred in him by the stories from the Florida country, he determined to go the assistance of the colonists of Texas, who were then engaged in their struggle with Mexico. News was received at New Orleans that the dictator, Santa Anna, at the head of a large and well-equipped army, was about to invade the country. Mr. Leonard came to Texas by way of Fort Jessup and Gaines' Ferry on the Sabine river, and going direct to San Augustine he entered Captain Henry Reed's company, marched for the West, and joined the Texas army near Victoria, on the Guadalupe. On the arrival of Skirlock's company at headquarters, Mr. Leonard, at his own request, was transferred to it, Colonel Morehouse's regiment. He served in this command until after the retreat of the main body of the army under General Houston beyond the Brazos, when he, with many others, found service in protecting the fleeing settlers. At a later date he was in the frontier service under Captain Alexander Horton, Colonel Lynn Mabbett's regiment, and was also with General Rusk in the uprising of 1838, when the Indians and Mexicans threatened the extermination of the Americans in east Texas. 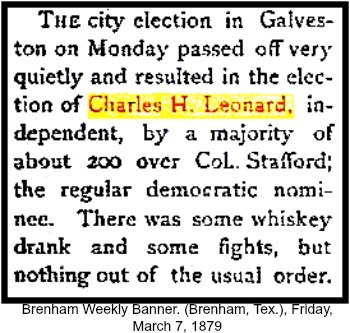 A few years after the city of Galveston was laid out Mr. Leonard came to this place, and casting his lot with the people of the same, he has remained one of them since. He married Adeline D. Reilley, of Galveston, January I, 1853. 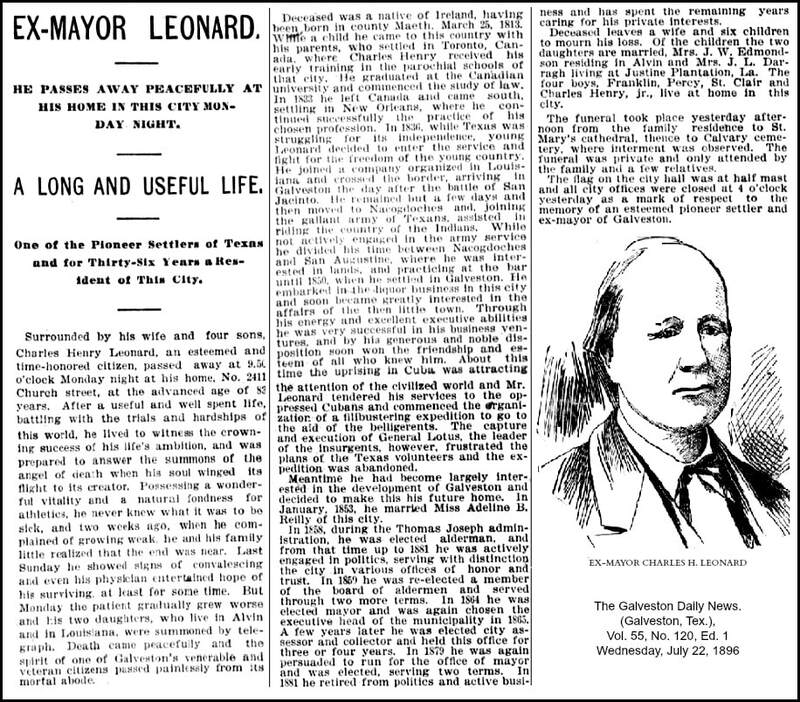 Mr. Leonard's pursuits, during his residence in this city, have been chiefly of a business nature, though he has, at one time and another, held a number of public offices. He has been Alderman of the city, Commissioner of the county, and Mayor of Galveston four times. The positions which he has held have come to him by reason of his fitness for them, rather than by any self-seeking on his part. When a candidate for office he has never been profuse in promises, nor has he ever made any which he has not honorably redeemed. As an officer he was always attentive to his duties, and required the same promptitude in his subordinates. His administration as Mayor was marked by economy, the preservation of municipal rights, and the payment of the public debt. Yet he was always mindful of the rights and privileges of the individual tax-payer, and, while seeking to infuse a spirit of enterprise and progress into the public service, he endeavored to act along the lines of fairness to all concerned. After the late war, when Galveston was dilapidated in appearance and low in finance, Mr. Leonard, being called to the office of Mayor, lifted the city to the condition of a live municipality, organized its various departments, gave security to life and property, paid all outstanding city debts, devised employment for labor, and extended his support and influence to Major Plumly in the construction of the first street railway ever built in Texas. At the same time, with the co-operation and under the able management of Dr. Dowell, he reorganized the city hospital for the care of the indigent sick. He caused the streets of the city to be lighted with gas, and purchased for the fire department the first steam fire-engine ever brought to Texas. He also endeavored, during a former term of service, to provide for that great want of the city, a supply of pure water. He recommended to the city council the propriety of boring at least one artesian well, but before the matter was fairly on foot he went out of office, and his suggestion was not acted upon until his re-election in 1879. Then, with the co-operation of an intelligent body of Aldermen, the funds were supplied, and a first business-like effort toward the solution of this vexed municipal problem was made. Thus, and in other ways, has Mr. Leonard helped to lay the foundation of the Island City, in whose growth and prosperity he has always exhibited the keenest interest, and with which his name will always be associated. In politics he has usually affiliated with the Democratic party in State and National matters, but in local affairs he has acted independently. He is a Texas veteran of the first class, having served his adopted country in every capacity in which he has been called, but the only remuneration he has ever received for his military services for the independence of Texas was a pair of pegged brogan shoes, an old flint-lock musket that he took the liberty of carying [sic] home with him. And two certificates as a soldier, each entitling him to 320 acres of land, which he subsequently sold for $10 apiece. Mr. Leonard has lost heavily at times by fires, and the late war also brought him his due proportion of losses. On the out-break of hostilities between the States his sympathies were naturally with the Confederacy, and he responded to the call for help by raising and equipping one of the first companies that went out from this city. Although suffering much in fortune for the part he took in the great conflict, he is today in comfortable circumstances, the result of industry, frugality and straightforward business methods on his part. He is singularly temperate in his habits, and though a member of no church and making no pretense as a moralist, he has always exercised a beneficial influence in the community in which he has lived. 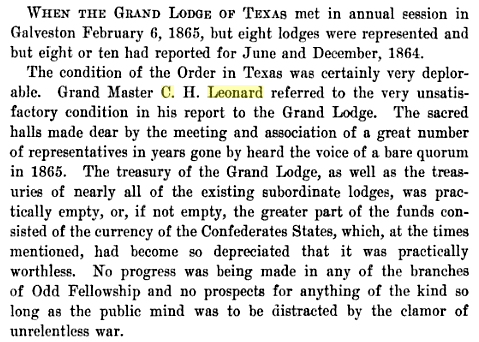 He was made a Mason in 1837, and has held the position of Grand Master of the Grand Lodge of Texas. 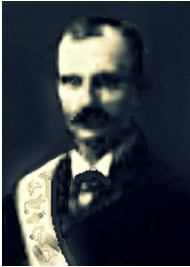 He is also a member of the Odd Fellows order, and has been Grand Master of the order in this State. To Mr. Leonard and wife have been born twelve children, but six of whom became grown: Ada, Laura, Franklin, Percy and St. Clair (twins) and Charles Henry, Jr.
History of Texas, together with a biographical history of the cities of Houston and Galveston, etc., Chicago: Lewis Pub. Co., 1895. 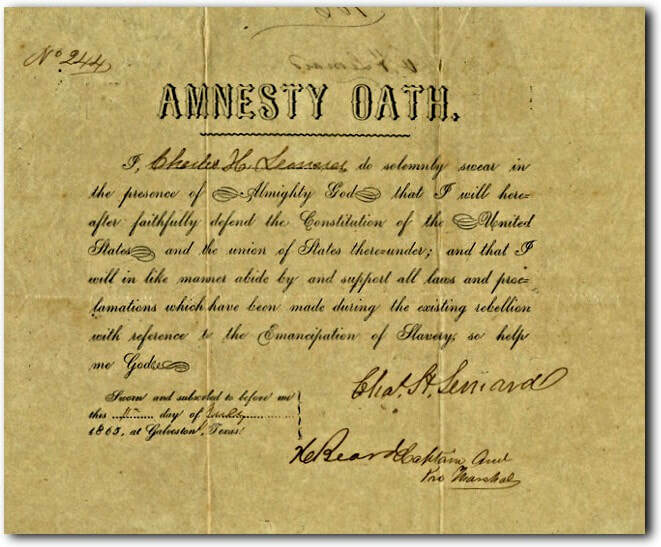 Civil War Amnesty Oath Signed, "Charles H. Leonard". Partially printed document, 9.75" x 8.0", Galveston, Texas, July 11, 1865. A scarce Trans-Mississippi oath of allegiance numbered "244" and signed by a former Confederate. It reads, "I Charles H. Leonard, do solemnly swear in the presence of Almighty God that I will hereafter faithfully defend the Constitution of the United States there under; and that I will in like manner abide by and support all laws and proclamations which have been made during the existing rebellion with reference to the Emancipation of Slavery, so help me God". According to the article at the top of this webpage, it states that Brother Leonard's interment was at the Calvary Catholic Cemetery, however a quick search in Find a Grave does not list his name. 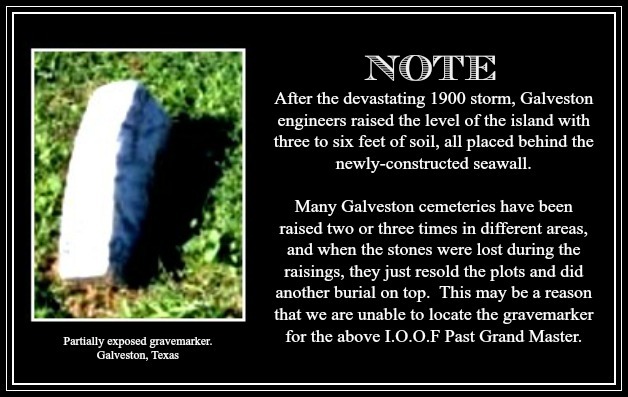 Perhaps he was buried in an unmarked grave or maybe the marker was covered as mentioned in the graphic directly above.